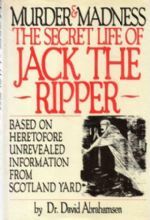 MURDER AND MADNESS The Secret Life of Jack the Ripper Based on Heretofore Unrevealed Information from Scotland Yard. Hardback. Reprint. The author sheds intriguing new light on these classic questions: who was Jack the Ripper and what were the forces that drove him? Approaching the case from a psychiatric perspective, Dr. Abrahamsen examined and analysed all the evidence available to Scotland Yard, including never-before-released files. He uncovered startling evidence that suggested JtR was two people, one of whom was a member of the British Royal Family. Illus., Appendix, Bibliog. and Index. 224pp. 8vo. h/back. Vg+ in Vg. dw. which has some 'doodling' to the dw's interior.